Bonita players congratulate Chloe Melanson after her two-run home run helped the Bearcats to a 6-3 win over West Covina. LA VERNE — The moment called for something big to happen, and Chloe Melanson didn’t let her Bonita High School softball teammates down Thursday. 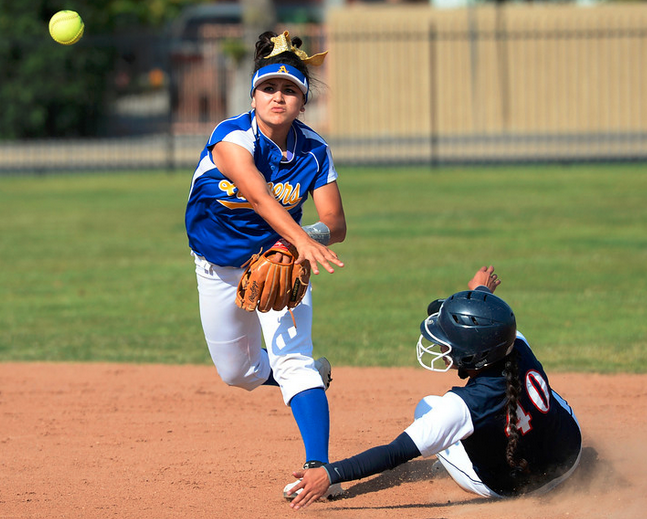 The junior right fielder hit a two-run homerun to highlight a five-run sixth inning and the host Bearcats opened Hacieinda League play with a 6-3 victory over West Covina, which is expected to be their chief challenger for a second consecutive league crown. 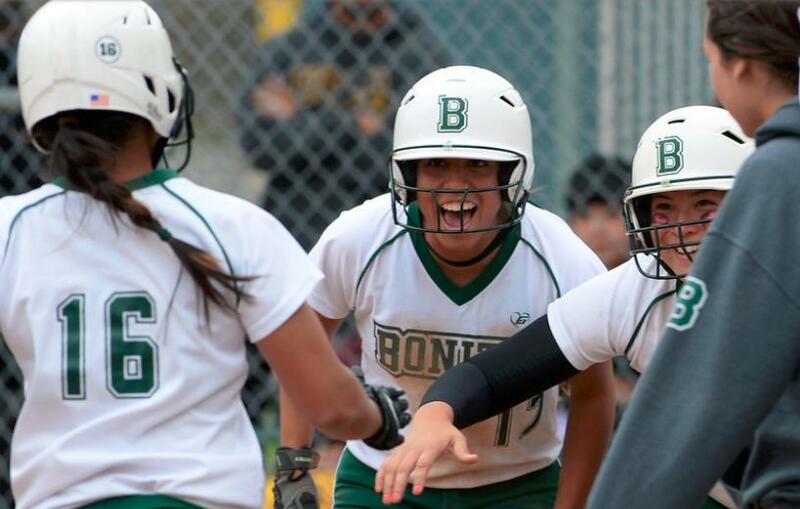 Veronica Ortega had two hits and Kaelin McFadden was steady in the circle for Bonita, which improved to 6-4. Jade Nua and Maddy Tickey had two hits each for West Covina, which slipped to 7-5. The Bulldogs were sitting pretty after taking a 2-1 lead in the sixth on a double by Nua and a fielding error. But the good fortune changed in the bottom of the inning. Berlyn Benavides reached first on an error to lead off the inning, and Melanson followed with her two-run shot to left field for the 3-2 edge. Singles by McFadden and Leticia Morales and two more West Covina errors allowed the Bearcats to push it to 6-2. Round One went to St. Paul on Thursday, but two rounds with Bishop Amat remain. The Swordsmen softball team scored six times in the fifth inning of its Del Rey League showdown with the visiting Lancers at York Field and earned a 7-5 victory. That leaves both teams at 2-1 in league play, atop the standings. 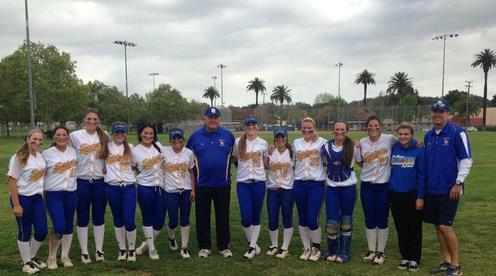 The victory was the first at any level – freshman, JV or varsity – for St. Paul’s seniors against Bishop Amat. San Dimas has been one of the top softball programs in the area for more than a decade, and Thursday San Dimas coach Don Pollard scored his 300th win, beating Wilson, 16-2. 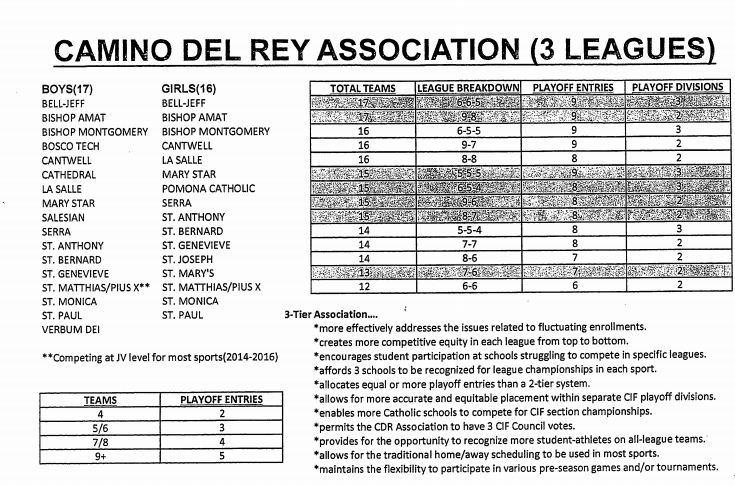 BREAKING NEWS: The Catholic Athletic Association approved new leagues on Thursday, voting to approve a proposal from Serra High School that puts Bishop Amat in the Catholic League South that also will include Loyola, Gardena Serra and surprising Salesian beginning in the fall. Salesian, who just won the Northeast Division which is considered Division 13, will appeal the decision that would send the lower-division champions to the Pac-5 Division, which is considered the top division in Southern California. The Catholic North will consist of Alemany, Chaminade, Crespi and Notre Dame. 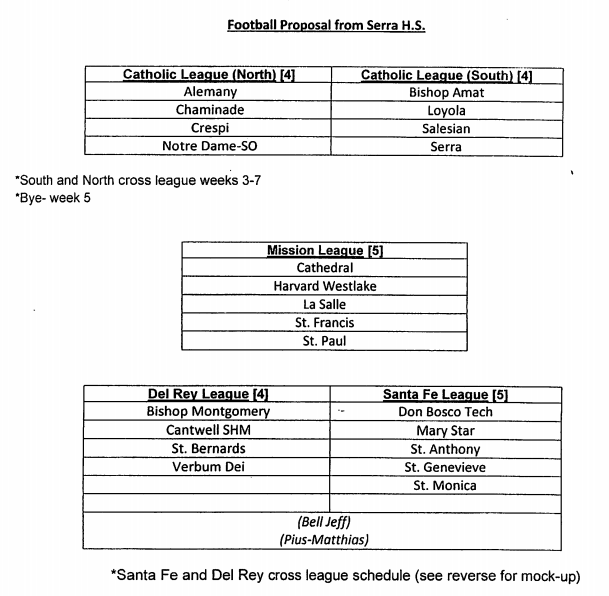 The Serra Proposal was approved on Thurday, creating the following football leagues to start in the fall. For all other sports, the Camino Deal Real Association proposal passed, which will group 17 boys and 16 girls into three leagues. They will be grouped into leagues by sport based on geography and competitiveness. COVINA — If you give the San Dimas High School baseball team an inch, the Saints will take a mile; if you give them an error, they’ll take a game. They did exactly that Wednesday. 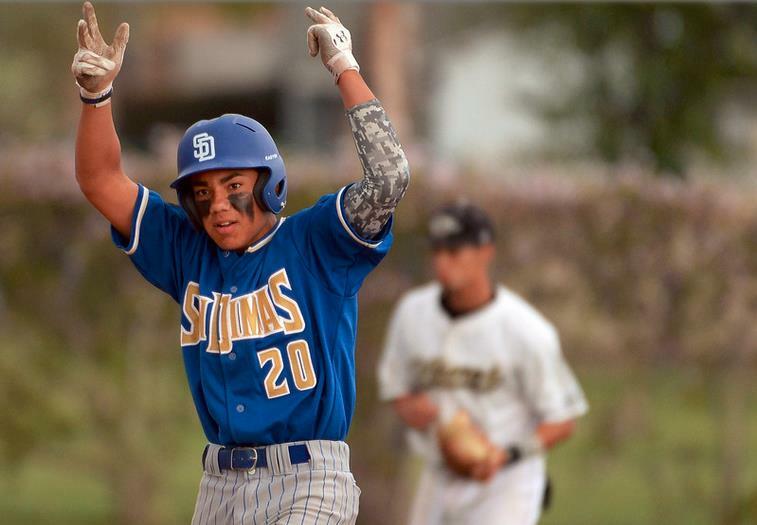 David Vargas followed up an error with a two-run double in the seventh and Peter Lambert threw a five-hit shutout as visiting San Dimas opened Valle Vista League play with a 2-0 victory over rival Northview. Lambert also struckout 10 for the Saints, who improved to 6-3. Northview, getting a four-hitter and eight strikeouts from James Ramos, slipped to 4-3. The teams will meet again on Friday at San Dimas. Ramos was battling Lambert nearly pitch for pitch and strike out for strike out before the Vikings blinked with a two-out error in the seventh. The Saints made them pay. Jonathan Longtin, who was 2 for 3, followed with a single before Vargas, who had two hits, hit a two-strike pitch to left-center field for a double, scoring pinch-runner Jeremy Marquez and Longtin for a 2-0 lead. Ramos struck out pitch-hitter Jared Leyland to end the inning. Northview, which had a runner at third in the first, fourth and sixth innings, but failed to score, caught a break in the bottom of the seventh when Adrian Olivas reached on an error to lead off the inning. But he was stranded there by Lambert, who struck out the next three batters, including getting Jacob Amaya looking to end the game. With the votes counted and Damien High School headed back to the Mt. 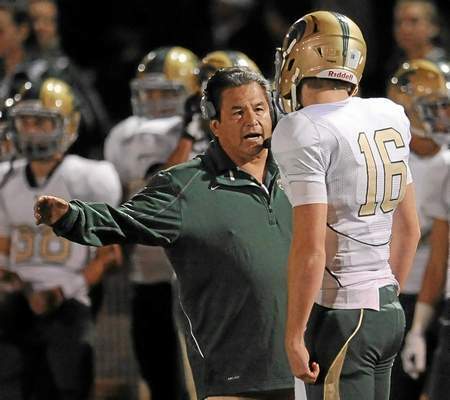 SAC Area for league grouping and into the Baseline League beginning next fall, Spartans football coach Mark Paredes isn’t exactly breathing a sigh of relief. Before Damien won its arbitration hearing to get out of the parochial grouping, the Spartans appeared on their way to being in a PAC-5 Division league along with several catholic football powers. Now, Damien will be in the Baseline League where it traded the likes of Bishop Amat, Notre Dame and Serra for Upland, Rancho Cucamonga and Chino Hills. Not exactly a huge relief. “I like the league we’re in now and it’s a good opportunity to play great competition and I’m looking forward to it,” Damien head coach Mark Paredes said. “To me it doesn’t matter. We’re going to work hard and be ready to play in whatever league we’re going to be in. The National Football Foundation San Gabriel Valley, Pasadena and Whittier Chapter honored 43 scholar-athletes at Tuesday’s banquet at Brookside Golf Course in Pasadena. The award is for scholar-athletes who maintain a minimum 3.0 GPA in college preparatory classes, demonstrate outstanding citizenship, leadership and community service. Each player was chosen following the nomination from their high school school with approval of both the student’s counselor and principal. Fox Sports analyst and former USC football player Petros Papadakis was the keynote speaker. STORY: The National Football Foundation San Gabriel Valley, Pasadena and Whittier Chapter honored 43 scholar-athletes at its 44th annual awards banquet at Brookside Golf Course Tuesday, handing out $20,000 in scholarship money. It’s the most scholarship money and honorees in the events history, a huge accomplishment for president Tony Ortega and staff, who continue to raise the bar each year. Fox Sports analyst and former USC Trojan Petros Papadakis was the keynote speaker and humorous as usual. But his point was clear that athletes need to prepare for life after sports and that those honored Tuesday were a great example for others to follow for taking education seriously. The National Football Foundation is also the group that conducts the annual senior Hall of Fame game, which has been held at West Covina High School in recent years.